Hello and happy Tuesday! In last Wednesday's post, I said that I would be starting an all new segment today. And after a week of waiting, here it is! This new segment is about, you guessed it, tech accessories! Every Tuesday I will be posting one of my favorite tech accessories. I was going to post a picture of my entire collection, but I figured it would ruin the excitement of seeing a new tech accessory each Tuesday. So today I will be starting this Tech Talk Tuesday off with my favorite iPhone 4 case. This is the case I use most on my phone. It is super cute, super durable, and I love it! I purchased this case from Amazon.com for $3.50 with free shipping. This case did not come with a tool to remove it from my phone so it is not that easy to get off of my phone. But, it is super cute and it goes with a lot so it is okay to keep it on for longer than a day. Also, this phone case is super durable! It has not yet lost a gem (and I have had this case since January) and I have dropped it several times and it has protected my phone without leaving a single scratch on both the phone and the case. 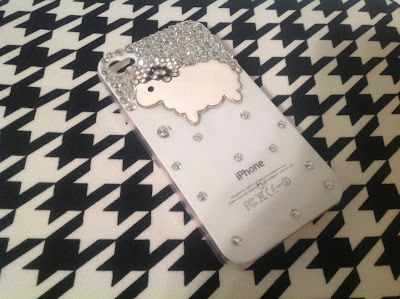 I love this case because it is super girly and sparkly, yet it has a meaning to me. The lamb on the case represents when I was in FFA and I raised my first lamb, Lady Baa Baa (awesome name, I know). The rhinestones on this case also made me think of her because she could not stay away from anything that sparkled. Unfortunately I had to sell her, but I was still able to have the memories of her with me by having this phone case on my phone.